Having a good sleep while listening to the sound of nature in your camping time is really something to cherish. But there were times when your great-grandparents used to struggle a lot while sleeping in the course of such outdoor activities. But now gone are the days of all those struggles. 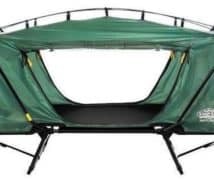 It’s because now there are some manufacturers that have thought a lot to offer such shelter that will give you a good sleep after a fun and fatiguing adventure. 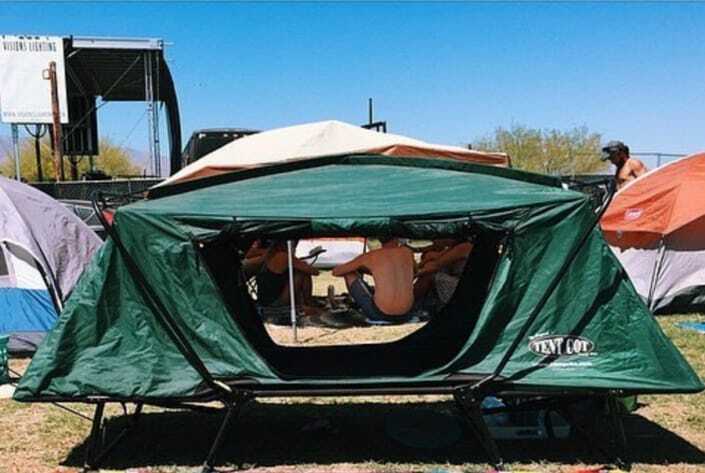 It’s the tent cot. While many of the campers know what the tent cot means, there are many who are yet to know about it. Tent cot is basically a cot for camping that is portable and can be used as a bed as well as a seat. So, you will get the privilege of two in one package. While you will find multiple tent cots camping around you, there are many that have proved themselves the best. Hence in this write, you will get to know the 6 best of them. →After-fold dimensions: 14 x 6 x 6 inches. →Nylon base and rain fly. Just like the title boasts, the Kamp-Rite has an insect protection system that tends to save you from the annoying bite and sting of all the insects out there that show up while camping. Besides, this cool feature, there is another best thing about this tent cot and that is its self-standing factor. So it would be a mistake to call it an ordinary tent because I’ll say it isn’t. And since you don’t require any stake or anything to build the tent, you can place it on any terrain you want starting from rock, concrete gravel to snowy surface. Coming in X-shaped design, it helps the tent to stand without the help of any other objects. And it is even easy to set it up. Moreover, the tent has a rain fly feature included that makes it a savior to protect you from a sudden rainfall. In addition, it comes with rust-resistant zippers that do not feel cheap and they are easy to use. However, although you can fold the tent to make it compact in size, but you cannot expect it to be as lightweight as they boast about. Moreover, it might withstand rainy situation but might fail to stand strong during heavy winds. Protects you from the insects. The self-standing factor helps you place it on any kind of surface. Features a rain fly that protects you from rainfall. The rust-resistant zippers do not feel cheap. Foldable so they can come compact in size. The tent does not weigh light. Might not stand strong during windy conditions. →Dimensions: 84 x 28 x 11 inches. →After-fold dimensions: 6 x 6 x 42 inches. The reason of this one from the same brand to be the best tent cot is for its title: Collapsible. What they mean is that you can take the advantage of this tent to detach it from the cot if you want to use them both separately. In short, the tent comes with 3 in 1 feature where you can get two camping stuffs into one compact package. And by compact, you can guess that they will come foldable. As for setup, they do not even eat your time to set the whole tent up as it is easy to do. Besides, the setup, another plus point is that the tent has spreader bars that you can extend for making the tent more spacious. Made from 190T polyester fabric, the tent snug knit blocks the raindrop pass into the tent. So you can say that the tent comes with rain fly factor. And coming with large No-See-Um mesh windows will let the air flow in and out of it so that you can have a peaceful sleep. 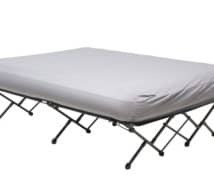 However, the downside is that the legs of the cot do not come with a lock so that it can hold the tent tightly with the ground. Thus, in windy conditions, chances are there that the tent might topple over you. Moreover, you will find them quite heavy for carrying it to camp out. You can detach the cot and the tent to use them separately. There are interior pockets for keeping your shoes. 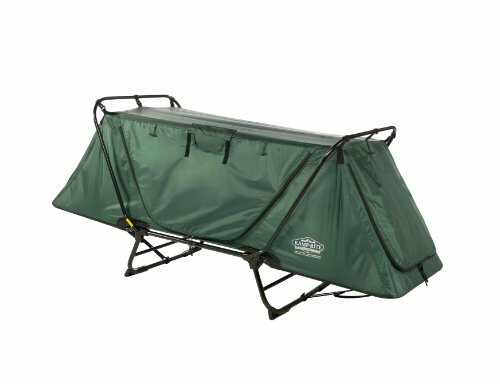 The cot legs do not have locks to firmly keep the tent clipped to the ground. →Dimensions: 84 x 32 x 11 inches. →After-fold dimensions: 9 x 8 x 42 inches. This is the enlarged version of the tent coming from the brand Kamp-rite. 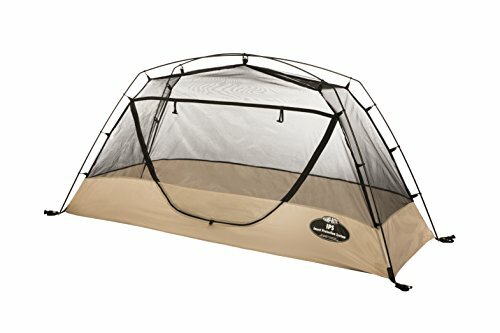 The brand offers everything with this tent cot that you basically find in their other models. However, as it is the Extra Large version, so you will find tent to be very spacious when it comes to sleeping inside it. However, it takes few minutes to set the tent up and is strong enough to be there for you in several camping plans. And this proves the durability of their product. Moreover, just like the previous one, you can also detach the tent and the cot to use them separately. In addition, just like you can detach the product, you can fold them as well to make it easy for you for your transportation. What you can find most disappointing is that the brand although has provided rain fly with the product, but it fails to offer good air-flow system. Moreover, the tent also lacks bigger windows so you have to deal with smaller ones for your sleep. As for the size, yes you will find them way too heavy while carrying it out. Super spacious to even house a taller and bigger person to sleep inside it. Fail to offer good air flow with rain fly. The windows are not bigger. →After-fold dimensions: 33x 30 inches. This is first ever tent of the brand for which they have earned much popularity from their customers. Although the brand discontinued this particular tent but it still does not stop them to be the best tent cot. You will still get them in online sites and take your chance to own them. However, this Kamp Rite Original comes in 190T polyester taffeta fabric with a taut mesh that tends to repel the touch of rain from getting into the tent. Not only the fabric is of great quality, the size and space of the tent are also found great. However, the brand has used aluminum all over the construction to make the tent weigh light but you might still find it quite hefty when it comes to carrying it. It’s going to be still a torture. But nothing will let you stop to get it because it wins all the match for its durability. 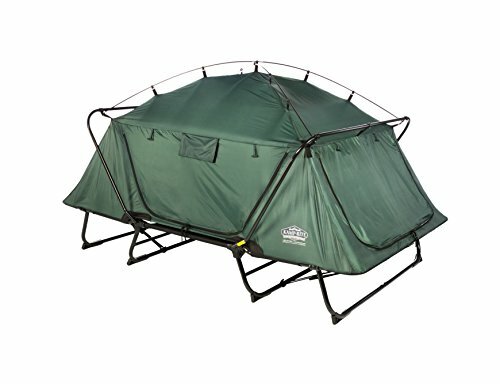 Like the other ones, this tent cot also has the brand’s signature features like rain fly with fresh air flow to and fro. In addition, you will find 4 windows with No-See-Um mesh that keeps all the annoying insects at bay. The best part is that you can not only use it as a cot but also a lounger or a chair that shows the versatile feature of the product. And the presence of interior pockets lifts the benefit side of the product. However, some of the users have found the cot to slide a tad till the campers are positioned at the mid of the cot. Other than that, the product is definitely a good buy. You can use it as a chair or lounger beside cot. The cot tends to slide a bit. →Dimensions: 84 x 53 x 11 inches. →After-fold dimensions: 56 x 34 x 8 inches. →Cot can be used as chair lounger. 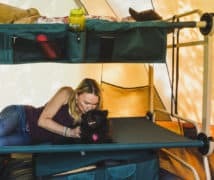 The specialty of this particular tent cot is that you can spend a great time sleeping with your best friend as it will give you the benefit of double cot to use it. With its sturdy aluminum frame, the tent cot tends to offer you easy setup and you will get two windows and two doors in addition covering with all the mesh that will keep you safe from any insect sting. Just like the other models, you can also make a use of the tent cot as a lounge chair. 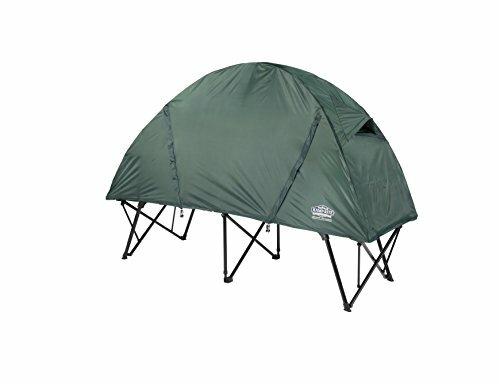 To add more, it also has a rain fly for which the tent will save you from any rainfall getting into it. Hence, this tent cot provides peaceful sleep that you can only wish for in your dreams. However, this tent has also a downside that most the bad guys can have. As for its size, you will find them extremely heavy that takes a lot of effort to carry it up for camping. Hence, you might not prefer to take it if your camping involves a lot of movement. Rooms for 2 to sleep out together. Can be used as chair lounger. Can be foldable to make it compact. Rain fly helps to stop making the tent moisture in rainfall. Extremely heavyweight to carry here and there. →Dimensions: 19 x 8 x 6 inches. With its easy setup and compact design, the Therm-a-Rest tent cot tends to stand out against all of its rivals. You will definitely get the tent very lightweight. And you will barely find any reason to stop yourself buying this tent cot. However, this is basically an inner screen tent that you can set up through equally great airflow system without any fly for protecting you against insects. Speaking of the fly, it basically comes with the product that works with the inner layer only. 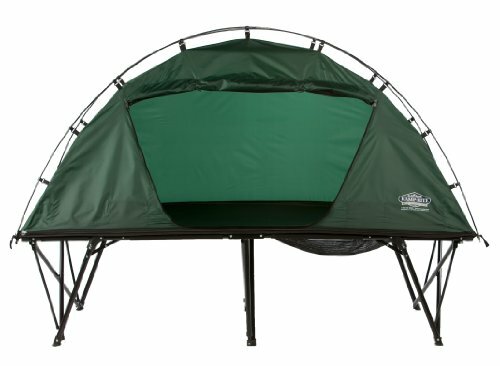 However, you will find the mesh screen at the bottom that gives you a complete covered space that you expect the tent to give. Although you will have to buy the cot separately but I can tell you that it is indeed worth buying. And to add more, it’s the flexibility of the product that makes it the perfect tent cot. 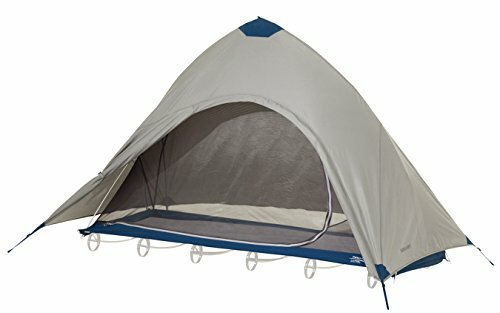 One of the disappointing parts of the product is that you cannot use the tent without the cot. And this is definitely not a good choice if you plan to take it in windy conditions. Thus, beware of it. You can fold the product to make it compact in size. It is able to position easily on even surface. You cannot use the tent without the cot. Hence you have to buy it. Not a good choice in windy conditions. Camping Cot comes in a wider variety of options that you can look for. Just like it is suggested, you can look for a single one if you find yourself a sole camper. Although it doesn’t meant that such cot will limit the feature and function for the single-person purpose. Rather, you will find most of the cot tents to be designed for solo camper and the brand offers a lot of privilege with the product. Double tent cot obviously would mean to offer room for two. So the product will have enough space to house you as well as your best friend for camping. And if you want to take your partner out, you can take since the double feature is able to handle 2 sets of the cot. It is known to everyone that outdoor activities like camping, backpacking or hiking requires a lot of travel. Dragging your stuff starting from the car to your camping spot and to add more, shifting places for hiking will need a lot effort. So, in this case, you would certainly want to chase one down that will have minimal weight in it. Although many of the tent cots weigh over 20 to 50 pounds, yet you will get many beneath 10 pounds that do not only weigh less but also provide good quality. The value of the tent cot does not only depend on the function and feature of the product but also the manufacturers of the tent. While some of the brands happen to offer both the tent and the cot in combination with a tolerable price range, some offer them to sell them separately that rather becomes more pricey for the budget. However, if you have saved some bucks in your wallet, you can still get a good combination of both the tent and the cot that will include more features like a carrying strap or bag, a sleeping pad and most importantly a rain fly. So, you have to ensure buying one that already possesses certain accessories. Durability also comes first when it comes to buying any item. And since you will be going out for an adventure, you will need to buy one that will serve you in camping for years. To understand the durability of the product, you need to check the materials that have been used in constructing the product since they say a lot about how long the tent cot will last. It is definitely not easy to get a best tent cot for your camping. You will have to keep both the plusses and minuses in mind before getting one for yourself. However, as the write has highlighted the best 6, it would be easier for you to choose the one among them since they are shining out from the other. Because, camping can be a great adventure if you have a good shelter beside you, or else bad tents can be the reason to spoil the fun.